Good St. Anne, you were especially favored by God to be the mother of the most holy Virgin Mary, the Mother of our Savior. By your power with your most pure daughter and with her divine Son, kindly obtain for us the grace and the favor we now seek. Please secure for us also forgiveness of our past sins, the strength to perform faithfully our daily duties and the help we need to persevere in the love of Jesus and Mary. Amen. Her feast day is July 26. Saint Anne played an extremely important role in the histories of major world religions, particularly Christianity. She produced Mary, a child born of Immaculate Conception. 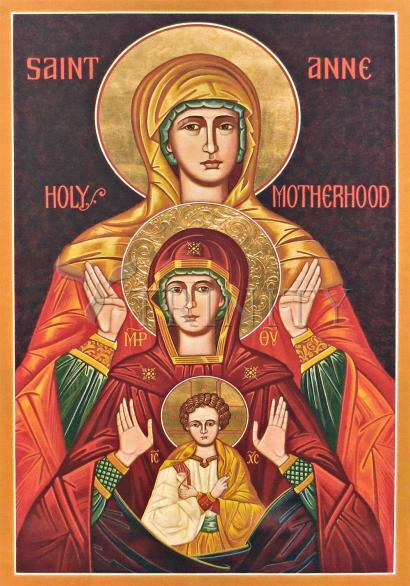 Mary later became the mother of Jesus. Saint Anne was the grandmother of Jesus Christ. She was born from the House of David, the line which was prophesied to give birth to Christ. In Hebrew, her name was quite possibly Hannah, as Anne is the Greek derivative of the name Hannah. Saint Anne is the mother of Mary, the woman who gave birth to Jesus by Virgin Birth. The Angel Gabriel came to Mary and told her that she would give birth to the Son of God. In the Gospel of James, which is part of the Apocrypha, you will find the story of Saint Anne. She and her husband Joachim were unable to conceive a child, even though they tried to do so and really wanted a baby. However, one day an angel came to them and told them that they would have a child. Since she was so overjoyed, Saint Anne promised that she would dedicate this baby's life to the service of God. Their daughter Mary was born. Saint Anne produced an extraordinary child, as she was born free from original sin. Being born free from original sin is known as an Immaculate Conception. Therefore, part of the reason why Saint Anne is so famous is because she produced a child born of Immaculate Conception. Saint Anne read the scriptures to Mary when she was a very small child. Saint Anne had promised that she would give her child to the service of God, and she kept her holy vow. When Mary was three years old, her parents brought her to the Temple and gave her to the service of the Temple. They did not see her again. Although she had wanted a child so badly, Saint Anne knew that she had to honor her promise to the Lord. Saint Anne and Joachim would not be able to raise the child since Mary needed to be raised in order to become the mother of Jesus Christ.